There comes a day in every trip we take that we just like to relax and pretty much do nothing. Well, Day 2 in Cape Town was just that. We woke early and headed downtown to look around, see what the FIFA Fanfest was all about, and maybe find some good souvenirs for the trip. Well, we made it downtown, and picked up a few things as we had planned, but one thing I really wanted was a World Cup scarf with the South Africa logo on it. Now, mind you, this was DAY 2 of the World Cup, the biggest sporting event in the world. How much inventory did all the stores and street vendors have of these particular scarves………NONE! I spoke to a couple of vendors and store owners, and they all said they were sold out of them a few days before the World Cup even started!!! You’d think that they’d stock up on what would be the most popular selling item at the World Cup….besides the vuvuzelas of course! So with the morning being a disappointment looking for these items, I pretty much decided I wanted to hit the pub to watch the matches for the day, especially the USA vs. England match that would be on…8 hours later. I had read about an English pub downtown that was the most popular place for ex-pats to watch matches, but we were there just a tad early….in fact early enough that no one was at the pub yet. 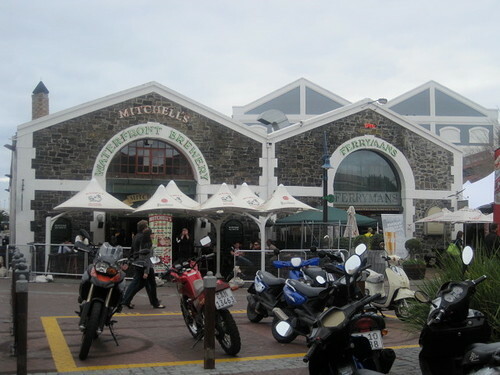 Seeing that it was off the beaten path a bit from the rest of the area, we decided to head back to the V&A waterfront and watch the match from the Ferryman, which is an infamous pub which shares a center wall with Mitchells Ale House, which is also a pub popular with ex-pats. Safe to say, 8 hours before the England match, Mitchells was already filling up, so we sat outside at the Ferryman. To pass the time, we had to watch a lot of sports, so we did. First there was the end of a rugby match that we didn’t really pay attention to, but there was a soccer match up next, so we didn’t really care. Well, that would’ve worked out fine if it hadn’t been for the big Springboks match that was on immediately after the current rugby match. Now for those that don’t know, South Africa rates rugby much higher than soccer, and it is the national sport if you speak to any locals. South Africa was playing France, whom they hadn’t beaten in 5 years, so this was a big one, and it was at home. I mean, why wouldn’t you schedule a huge rugby test match in Cape Town at the same time of the World Cup. Seems logical, no? Anyway, South Africa killed France, and reassured everyone at the pub, which was full now, that they do have the best team in the world. We had followed rugby a bit when we were in Paris back in 2007 when the Rugby World Cup was going on, but not much since. Well, I think I might follow the Springboks a bit more now, as I started to get into it again while were watching. My old man would be proud, but I have a million questions about the rules again, so there’s our first conversation when I get back to the states Dad. This was about 6 hours into the night! After that match, there was a soccer match, which included Nigeria. All the teams from Africa have quite a bit of support down here, but the locals are pulling for all of them as well, as they want to see their continent do well, and hopefully have a few teams progress. At the time of this blog post, the only team that looked good after the first round of group play was Ghana, who had won on a penalty. We finally get to the USA vs. England match, and the pub begins to fill up again. Fans from England, USA, etc surrounded us. We sat next to a couple people that were in from NYC, and had just landed in Cape Town a few hours before after a 30-hour trip that included a connection in Dubai. Again, if you traveled to the World Cup this time around, you were a true fan I feel. Well, the match started out well for England, as they slipped one by Howard only 5 minutes into the match. But in true England fashion, they have an unmemorable blunder by their goalie, which allowed the USA to tie it up, and ultimately get the draw in the match. All in all, I was quite disappointed in the match, as I thought England would rip through the USA, but they didn’t show much desire after they gave up that terrible goal, but at least they got the point, and will play Algeria next on June 18th in Cape Town. After the match, we decided at that point it was time to turn in for the night, as we had been at the pub, for what my friend Iain would call, a solid 10-hour “sesh” of boozing. We also had some big plans the next day, as we headed to the Cape of Good Hope and planned to spend some time driving up the west coast of the cape. More of that day in the next post. 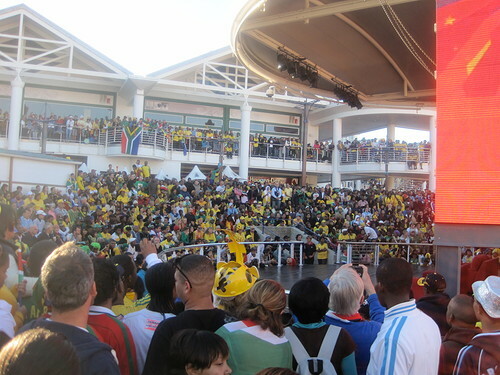 Cape Town…..and those crazy Vuvuzelas! WURRRRRRRRRRRRRRRRRRRRRRR! WURRRRRRRRRRRRRRRRRR! That’s the first sound we heard when getting off the plane in Cape Town, coming from the vuvulezas that are a staple with South African sports. 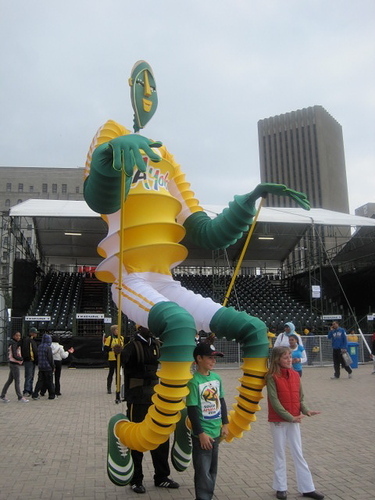 They were especially noticeable the day we got in since we were 24 hours from the World Cup starting, and South Africa was in the opening match. It was more electric here than I remember at any sporting event than I have ever been to….and the game wasn’t even in Cape Town!!! This country is really behind their team, or as they call them, Bafana Bafana (which means “Boys, Boys”). There were two games on the first day of the World Cup, and we had tickets to the “other” game, which was being hosted in Cape Town at their new stadium, France vs. Uruguay. But we’ll get to that a bit later as we packed in quite a bit during the day before we hit the match. We knew we only had a little less than 5 days, so we wanted to do as much as we could while down here, seeing this isn’t exactly the easiest locale to visit. 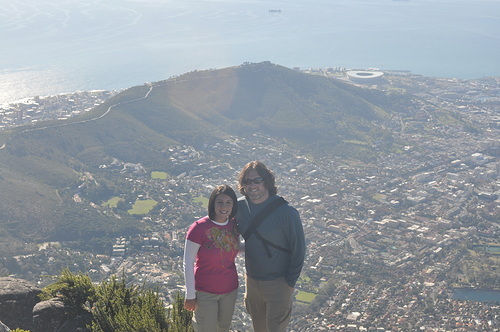 Note, we flew from Madrid, and it was still another 5,000+ miles to get down to South Africa. For all the fans that made the trip, they definitely put on the travel legs to get down here. Anyway, on to the day. We were told the weather in Cape Town can change every 10 minutes, so if it’s predicted that the day will be clear for the most part, you should take advantage and head up to Table Mountain, because you might not get another chance. Friday was a perfect day. Not a cloud in the sky, about 60 degrees, and no wind. So to combine two things we wanted to do, we hopped on the bus tour around the city, as we usually do, to knock out a lot of stuff in one package. Table Mountain happened to be a stop, so we could get dropped off, check it out, and then hop on another bus when we were done, as they came around every 20 minutes or so. The bus tour actually wasn’t bad, as it was a double-decker bus, and it was open up top, and with the perfect weather, it just made for a great time. Now being at the top of Table Mountain, you get to see what has been voted the last 3 years, the most beautiful city in the world. I’m not sure if this is the best view of the city, as pictures from the ocean and out on Robben Island looking at the city from the water tend to look a bit better, but you can see how unique the city is, and how amazing it is that the mountains literally run right into the ocean, and everyone lives on the flat area between. I had seen pictures of this city for years, but couldn’t really believe I was there until we snapped some pictures. The views from up top are incredible, and the luck we had seeing it on a clear day was even more amazing. Just for the picture opportunities alone, I suggest getting up there. I thought the cable car would be a bit scarier, but it’s very stable, and the floor actually rotates inside as you’re going up, so everyone gets a chance to see all the views it has to offer. After taking about 500 pictures up top, we headed down to see the rest of the bus tour, which took us around Lions Head mountain, and then through the ritzy neighborhoods of Cape Town, which were much different from downtown, and had their own vibe as well. I can see why many who are from Cape Town never leave, because the landscape of their city is so unique and beautiful it would be hard to beat. The tour ended, and we had about 15 minutes to get to a pub or anywhere that had a seat to watch South Africa play Mexico in the opening match of the World Cup. Of course, it was rather hard finding a seat, but we took a back way into a restaurant, and ended up having pretty decent seats outside to watch the match….and of course grab a few beers. We took off about halfway through the second half, as we had to drop off our bags, and then head to the stadium to see our match, but we were there long enough to see Bafana Bafana score and the restaurant went crazy. Dancing, cheering, blowing their vuvulezas, singing songs, and everything else you can imagine. It was something we’ll never forget. So we head over to the stadium, which is only about a 10 minute walk from where we were staying, although with security checks and the volume of people, it took more like 30 minutes to get inside, but none the less, it was close. Now, the seats for the World Cup were split into three categories, and I had one match in Category 2 and one in Category 3. The only thing was you had on idea where in those sections your seats were until you printed them out in South Africa. Well, we got lucky for the first match, as we had 2nd row in the club level of the stadium!! Our seats couldn’t have been any better for Category 2 tickets. You know you have good seats when you can hear the ball being kicked, even with 60,000 people screaming and horns blowing everywhere. On top of that, the new stadium is a work of art, and extremely modern. The match ended up being pretty dull, 0-0 draw, and in the following week it has been dubbed the most boring match of the tournament, but I really didn’t care, as we were there, and had great seats….albeit for a boring match! Not a bad view for the first match, eh? That really covered what our first full day in Cape Town was like. The best part at the end of the day was we knew we had 3 more days, another match to see, and whatever else sparked our curiosity. We knew if the rest of the trip was anywhere near as great as this day, that this trip would be one for the books. 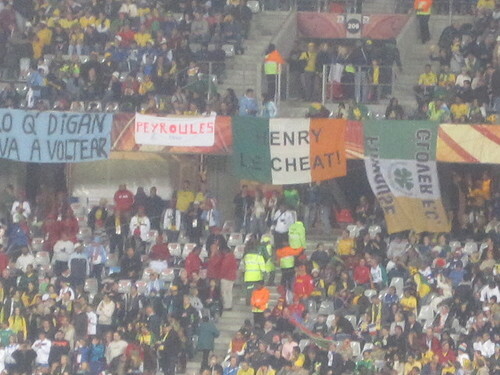 Best banner at the match...too bad they were forced to take it down! So four years ago after attending the World Cup festivities in Germany, we immediately decided that we would do all we could to try to attend the next World Cup in South Africa. 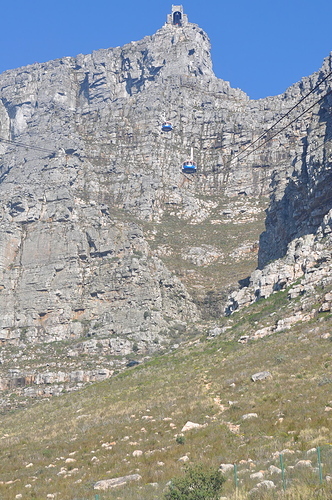 I had Cape Town on my list of cities to visit worldwide, so it would kill two birds with one stone. Well after 4 years, we finally made it here, and we are not disappointed. Now, getting here was a bit of a rollercoaster. Of course we had to find a way to get down here from Sicily, so that’s when the adventure began. We hopped a flight from Trapani in Sicily to Madrid, Spain….the only flight out of Sicily that flew direct to Madrid in fact. We then had an 8 hour layover in Madrid, but thankfully got upgraded to business class for the long flight to South Africa, so got to chill in the lounge, which has been touted as the nicest one in all of Europe. Some relaxing, dinner and drinks later, we headed to the gate to hop on our flight….which was chaos! Everyone that was waiting for the flight was headed to the World Cup, and they must have all thought the plane was going to leave without them because them rushed onto the plane faster than hell. We got to our seats, and were actually seated in front of two Americans from LA, and next to a family of 8, all in business class, from Caracas, Venezuela. Other countries represented on the plane that I noticed were England, France, Italy, Uruguay, Paraguay, Mexico and a few others. It was a multicultural flight to say the least. So we took off and embarked on our 10 hour flight to Johannesburg, only to be followed by another 2 hour flight down to Cape Town. Of course none of our travels come without hiccups, and we hit our first one on the flight down to JNB…the TV’s in our seats didn’t work…for the whole flight! Safe to say, I was able to sleep for about 8 hours, but Annemarie got about two winks and stared at the travel map for the rest of the flight. Misery was waiting in Johannesburg, but we never found it, because the airport was so alive and packed with people you couldn’t help but be full of energy. Not much to say on the layover part of our trip, other than we hit a pub, and saw R. Kelly with some security walking through the airport. Despite his troubles in the USA, he’s regarded as a God down in South Africa, and the girls were going crazy to say the least. So we finally hop our flight, and head down to Cape Town, which was an incredible flight, just because of the landscape you see on your flight down. And then getting into Cape Town, with Table Mountain from the air was pretty cool. We landed, got our bags, got our rental…..and then ran back and got a different rental since for the second time on the trip the cigarette lighter didn’t work to power our GPS. Thankfully, swapping cars wasn’t an issue, and we were on our way. Did I mention that they drive on the left side of the road down in South Africa? Yeah, let the adventure begin on the road now! It actually wasn’t that bad, other than the fact I kept hitting the wipers instead of the turn signal, and I couldn’t find reverse for the first day….and good thing I never had to back up! Didn’t realize there was a button on my shifter that allowed the car to be put in reverse. That’s clever, but how was I to know that? We made it to the hotel without much issue, a little B&B in Green Point, and headed down to the V&A Waterfront for the first evening and a quick dinner to complete the day. We decided to turn in a bit early to get a full day in, and that’s where we’ll pick up next time on Reading Rainbow!